I have finished the repaints for the 7 & 49. And I am almost finished with the 1, but I am unable to find reference images for the door side on gemini 2's. By the way, would people like to see a route 2 repaint added? Thanks for the reply. I am planning on doing BH3 repaints only. Hopefully there are some good pictures of the omnicitys. Just started a "The Big Lemon" repaint. I might release it with the Brighton pack or by itself if I do release it. @Ecronbuses Ooh, that's looking juicy! Lemon juicy, even! I'd love to see it released! I'd say separate, as I don't think The Big Lemon's part of Brighton and Hove. Great! I'll work on it and probably add a 56 branded version. 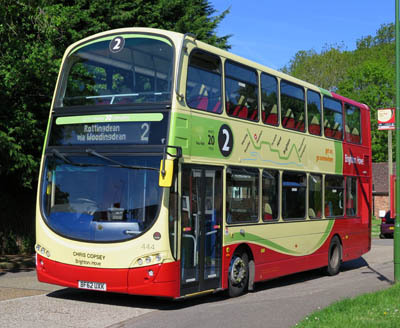 Never been to Brighton, but from the pictures I've seen from bus' liveries in Brighton, those look exactly the same! Great job, looking forward to release! Thanks so much! I am about 95% from completing the pack, which will include 3 buses. Hopefully it will be released soon! I’ve been working on a “Buzz around Brighton” repaint. It’s not complete yet meaning it won’t make it into V1 if my secondary operators pack. Those all look great and authentic, but what map will we use those on? Otherwise, the reskins look really cool! Those all look awesome and authentic, but what map will we use those on? Thanks again for the positive feedback! In all truth, I don’t know. There was a point when I thought about making a Brighton map, but it took me an hour to place a road and I abandoned the idea due to my lack of understanding in the editor. Thought I’d revisit Radington, more progress soon!